You cannot deny that women’s financial requirements are different from men’s. So, let us look some of the smart money choices that you should make as a woman. It can be quite difficult to manage money, especially for working women who have thriving careers and a family to take care of. However, it isn’t impossible. With more and more women earning an income, knowing how to manage finances becomes imperative. A little knowledge and careful planning, can help women gain complete control over their finances. Here are some hacks that can get you there. Spell out your goals: The first step is to define your goals. Whether it is saving up for an international trip, buying your own vehicle or investing in your retirement fund, knowing exactly how much and where you need to put your money can help you plan your finances. For instance, a professional degree for your child that costs around Rs. 10-15 lakhs today, would sum up to around 25-30 lakhs, 10 years from now. You can use our education calculator to help you find out the total amount and monthly savings required to meet this goal. Similarly, short-term goals such as renovation, travel, gadget buying, etc. should also be thought-out and planned for, in advance. Defining goals will offer you an enormous set of benefits and peace of mind. It can also help you choose a suitable financial instrument in which you can invest your money. Future is first: Most of us tend to postpone our future planning. Women, in particular, do this because they feel that putting their money towards their family’s current needs is more important. While this may be necessary, did you know that women generally live longer than men? It is also why you must put money away for after your retirement. Investing at an early age is a must as it offers the benefits of early compounding. Retirement is not just a fund; it is your future. When you no longer have a steady income, this fund will help you deal with financial emergencies and lifestyle changes. Investment is a priority: Even if you earn a small income, investing even a fraction of it can make a huge difference later. To get started, invest small amounts on a regular basis. Systematic monthly investments can help create a sizeable amount over the years. You can consider instruments like PPF (Public Provident Fund), Equity-Linked Saving Schemes (ELSS), Systematic Investment Plan (SIPs) that offer higher returns as compared to just parking money in your saving account. You can also consider physical assets, if you are keen on having tangible investments. Small amounts over the years can result in a large corpus in the long run. The right investment instruments can help you save on taxes, which means more savings for you., which means more savings for you. Health and life covers are two of the most important insurance policies a woman needs. These can be altered to suit different requirements, which is why they must be carefully selected. Health Insurance: You maybe young and in the best of health, but health problems can strike at any time. And with medical care costs on a constant rise, treating these issues can burn a hole in your pocket. 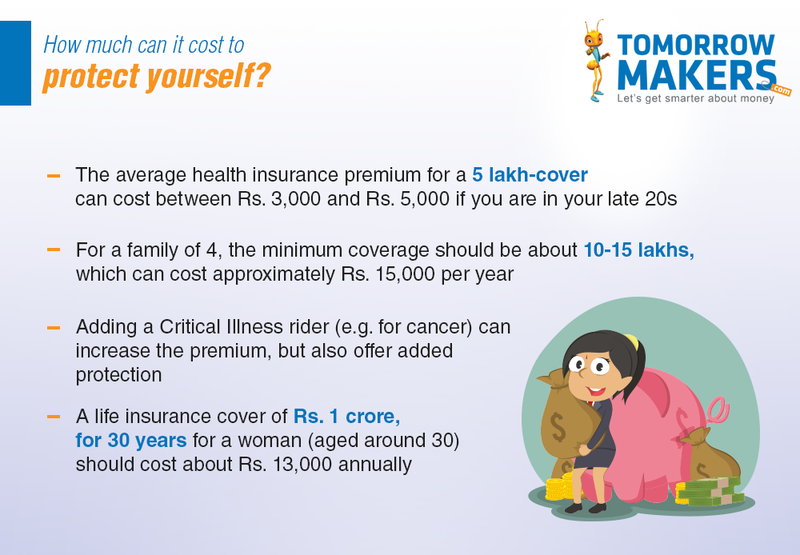 With the right health insurance plan, you can save on these costs. More importantly, these covers can provide protection against women-related diseases like breast cancer and cervical cancer, cardiovascular diseases etc. Some plans also include maternity and childcare benefits that are ideal for married women and housewives. Life Insurance: Life cover is a must-have if you are a working professional. In addition to helping you save on taxes, life insurance can ensure a comfortable future for your loved ones, if something happens to you. Providing a shield to your dependents becomes your responsibility. You can use our life insurance calculator to find out exactly how much protection you need. It can provide financial assistance in an unforeseen event that could potentially wipe out your savings. In the case of health insurance, having suitable cover can ensure you get the best treatment without having to worry about the financial burden. Along with helping you save taxes, a life insurance plan can create a cushion for your spouse, children and even parents if anything happens to you in the future. 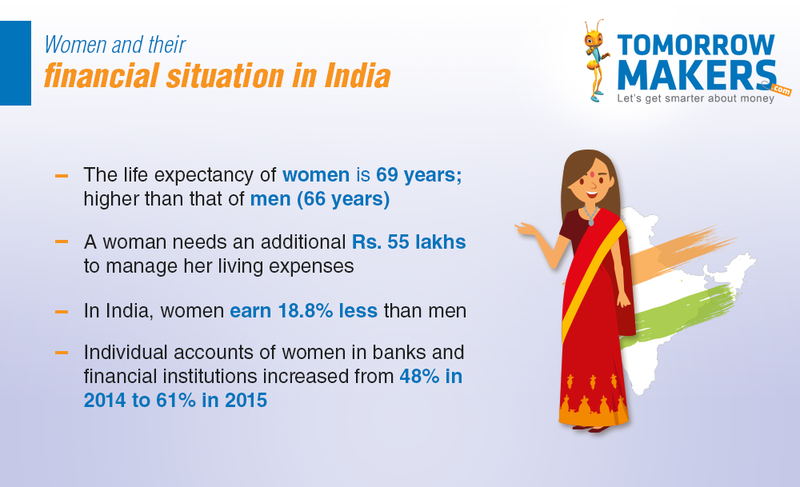 Planning your finances is just as important for women as it is for men. Knowing where your money is going and the wealth it is building up can give you, a comfortable future, the ability to deal with any situation and peace of mind.